The billboard was put up by activist group Led By Donkeys, which reminds people of what MPs have said about Brexit by turning their statements into tweets and putting them on billboards across the UK. 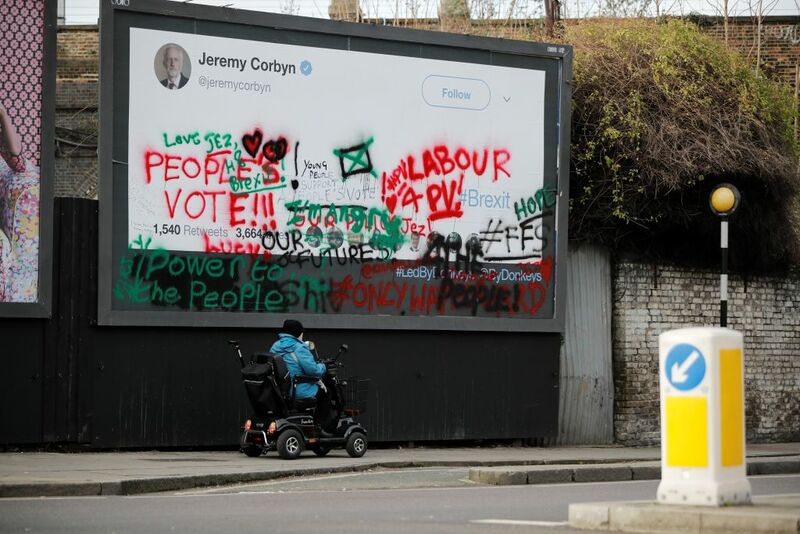 On Wednesday, the group targeted Mr Corbyn in his own constituency of Islington North by leaving the tweet blank and encouraged young Labour supporters to write anti-Brexit messages, including “Love Jez, h8 Brexit” and calls for a People’s Vote. Less than 24 hours later the messages have been covered up and replaced by a new version of the blank tweet. Writing on twitter, Led By Donkeys said they had permission from the billboard company to paint on the poster. “Just been told Islington Council ordered the messages to Jeremy Corbyn be covered up," they wrote. “We paid for the poster, the billboard company that owned the site were 100% cool with it being painted, and the young Labour members who wrote on it had police permission. The billboard targeting Jeremy Corbyn with the anti-Brexit messages on it. Islington Council said the removal of the graffiti was simply a "mix up" and a staff member had reported it after it was "defaced". A spokesperson said: "There’s been a mix-up. If any poster is covered in graffiti, we let the billboard company know. One of our staff reported this poster had been defaced, as usual, and the billboard company changed the poster for a fresh one. "We’ve made staff aware that it’s ok for this poster to be written on and graffiti on the poster does not need to be reported, unless there is offensive or obscene language." However, Led By Donkeys said that they had checked with the billboard company, Build, who said that the council had insisted the writing was removed - despite the company making it clear it was done with permission. The message-writing was organised by anti-Brexit campaign For Our Future’s Sake, who say they had not been told why the writing had been removed. Amanda Chetwynd-Cowieson from FFS told talkRADIO: “As far as we are aware the council contacted the billboard company and said they would be replacing it with a fresh poster. “We haven’t been told why and can’t quite see where it has gone wrong.